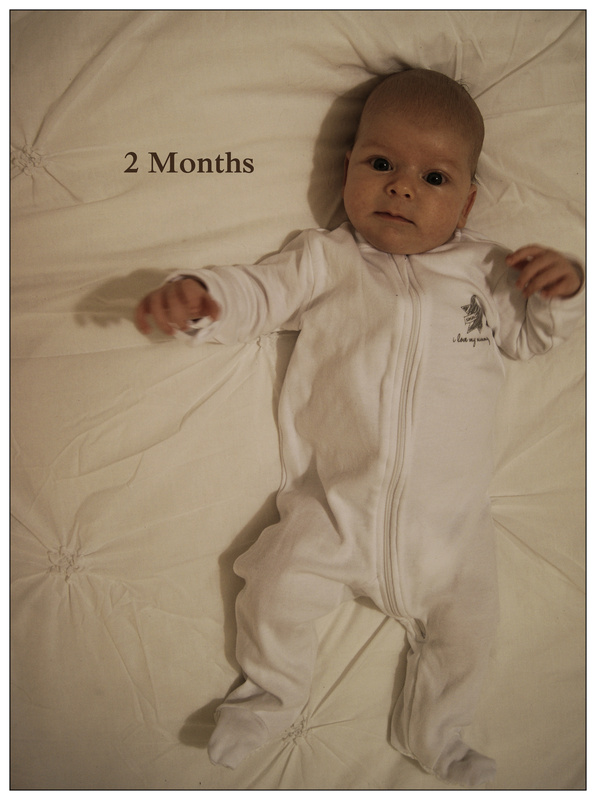 I can’t believe I am already writing a post about our handsome little man being 2 months old! Our little man is hitting all the milestones for his age and more, which I couldn’t be more proud of! He easily lifts his head and responds to sound, especially mine and Sean’s voice. His beautiful eyes follow us around the room and when we are doing tummy time on his play mat he loves holding his little head up, even doing mini push-ups if he is not too tired, and smiling back at us. There is even a bit of a giggle coming through but it sounds more like a pterodactyl screech than an actual laugh, I love it anyway. But oh boy has our little man found his voice! Most of the time it’s just noises and sighs but every now and then he makes the cutest little Sounds. Like when he is done drinking he sometimes lets out the most satisfied little sigh and in the middle of the night I am often woken by his gorgeous little dream noises. They are so lovely to hear and it makes me so happy that it sounds like he is so content. There are however the days when finding his voice means a fair bit more screaming and moaning rather the cuter sounds we have been hearing of late. Even those sound beautiful to me, although hard to hear at the time, I can now recognize my darling son’s voice from across a shop or above any other screaming kid. It makes me feels so connected to him, like we have our own special language and bond that only I get! This month has been a bit easier for me to get out and I feel like I can handle doing things and meeting up with people much easier. We had our 6 week check up with the doctors and she was very happy with our progress. He is slowly climbing the growth chart and is staying just above the average for his weight and height. But I will find out more tomorrow when we go and see the Early Childhood Nurses. We have even been getting better sleeps, which I am really grateful for. Our first sleep is from 9-2/2:30 and our second sleep ranges from 3 – 5:30/6ish, then we have another early morning nap till about 7/8am. I am loving this, although it doesn’t always happen as we have had a nights every now and then which are much more broken. It has however made me a much happier little mommy as I feel like I can take on the day much easier with one span of full sleep! I am putting this big sleep down to our new routine, every night he has a bath at 7:30, then a full body massage (lucky for him his mommy is nearly finished her course) then a nice feed and lots of cuddles, songs and a story. He pretty much always nods off during the story or feed and then we pop him in is cradle. I love this routine and I now know its good for him too as he knows what to expect and he drops off to sleep so much better than before. Our daytime routine and sleeps are terrible though, he pretty much sleeps wherever he wants and wherever he wants. I have tried to establish some sort of routine with him but as soon as I put him in his crib or cradle he screams so I end up with him on my lap or in my carrier sleeping. At the moment I think it’s more important that he is sleeping his recommended time rather than where he sleeps during that time. But that is my only struggle with him, his colic has settled down a lot, although I suspect it’s why his second sleep at night is a bit shorter cause he usually wakes up with tummy cramps. We had one case of slight nappy rash but that was soon sorted. 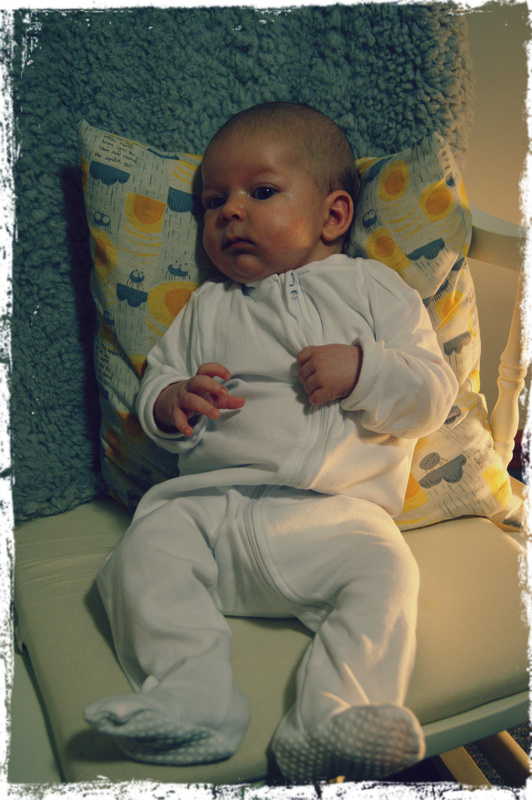 I have even decided to take the cloth nappy plunge and am using then more regularly during the day. Only when we are at home though cause I am not sure what to do with them when we are out. They are fantastic and I hardly have any blow-outs with them. To save us money and prevent too many toxins coming into contact with he soft and sensitive little bottom I have made our own nappy wipes. It was so easy to do and so convenient that I am off tomorrow to get more cloth so I can make some more spare ones. The most amazing thing about being his momma is watching him grow and learn new things. It’s crazy seeing him realise stuff or smile when he figures something new out. Or even just noticing him reach a new milestone, like the most recent one when I saw him grab a toy for the first time! SO proud! Well another month down and I can’t remember what our lives were like before he came along. It feels so right and I even though there are some hard times I am loving it.